As Moroccos leading surf camp, Surf Berbere takes away all the stress of planning a surf holiday and instead give you the chance to surf some of Moroccos best waves. Surf Berbere believes that a surf holiday should be a real experience too, which is why the majority of thestaff are local folk from Taghazout and the neighboring villages. Surf Berbere job is to make your surf holiday out with them in Morocco as easy and enjoyable as possible. Theres nothing better than waking up and being able to jump out into the mellow waves of Hash Point right in front of the surf camp. All the surf camp levels have balconies overlooking the ocean and our roof terrace offers stunning panoramic views over Panoramas, Hash Point, all the way up to Anchor Point. Surf Berbere doesnt want to just offer you the standard surfing holiday of wake up, eat, surf the local breaks, eat again, party, sleep, 7 days in a row then fly home. Sure you might be happy with a nice tan and being an alright surfer, but Surf Berbere want to get you out of the isolated bubble of a surf camp and experience some of Morocco. Surf Berbere wants you to leave Taghazout feeling like you have been on a real surfari, and explored the cracks and crevices of the area, got a bit of a feel for the local Berbere culture and vibes. This is why throughout the week we try to do trips taking you a little further than the average Moroccan surf camp. Surf Berbere can show you the beautiful surfing and fishing village of Immsouane, with its huge crashing Cathedrals beach break and its long mellow peeling right hander bay perfect for beginners. We can take you south to Tifnit, a gem of the south Moroccan coast-line. Exposed and consistent breaks with lefts and rights, this deserted beach is almost guaranteed to bring you a wave. Then on the flat days well take you up to Paradise valley, the Kasbah and around the Souks. Taghazout is a small fishing village about 20 kilometers north of Agadir. Since Europeans came to Taghazout in the 1960s, it has developed into the surfing Mecca of Morocco, with multiple world class waves within a stones throw of each other. Surf Berbere is perfectly placed literally 5 meters from the jump off point of Hash Point. You can check the surf from Panoramas up to Anchor Point while you sit and enjoy breakfast at the cafe, and then Surf Berberes team of Moroccan guides and instructors can take you to find the perfect waves for you. Within a 15 minute drive, you have about 20 different world class spots that all light up on the right swell. 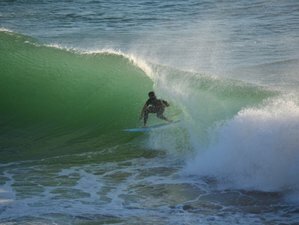 If you are a beginner there are always perfect chest to head high waves on a nice, safe, sandy bottomed beach. Surf Berbere doesn't just use one beach. We drive to the beach that is going to be perfect for you on that day (unlike most other surf schools that will just use the same stretch of beach day in, day out). This means that you will get the opportunity to get as many green waves as you can! Your day will start with breakfast by the sea, served at the Surf Berbere Cafe, just a couple of feet from the waters edge. Ideal for checking out the conditions while you fuel and wake yourself up. For dinner you will be up at the surf camp's roof terrace, tucking into a mixture of barbecues, Tagines and local produce, soaking up the views of sunsets and the atmosphere. We take lunch to the beach and will be either barbecue or sandwiches and served at the surf destination chosen for that day. Agadir (AGA) is the nearest airport and is only fifty minutes away. Marrakech (RAK) is another option but you will need to take a bus or a taxi to get to us. The transfer from Marrakech is 100 EUR in a taxi, about 10 EUR on a coach (coach company is CTM (http://www.CTM.ma) about 4 and half hours down. Ihre Anzahlung ist vollständig erstattbar, wenn Sie die Buchung bis zu 7 Tage vor der Anreise stornieren. Surf Berbere bietet eine Auswahl an tollen Surf & Yoga Urlauben in und um Taghazout an. Für diesen Veranstalter können Sie Ihre Buchung durch BookSurfCamps.com garantieren. Alle gängigen Kreditkarten werden akzeptiert. Ich möchte gerne den BookSurfCamps Email Newsletter erhalten, mit speziellen Surfcamps Angeboten und Rabatten. Teile diesen Surf Camp mit deinen Freunden.